Spring is upon us and I have something awesome for you to do with all those books you loved, but have been hoarding on your shelves, and in your closets & garages… swap those old stories for new adventures! How it works: Everyone brings up to 10 books they’re ready to part with; we mingle, pick out new-to-us books to take home, and the remainders get donated to a women’s shelter or senior center (TBA)… everyone wins! You will receive (1) ticket for each of your accepted books. Each ticket may be redeemed for (1) new-to-you book. ~Books for Young Adults (YA) and older are welcome. DO bring any type of fiction & literature. DO bring nonfiction titles (i.e. memoirs, biographies, cookbooks, self-help… books you would recommend to people you know). DO NOT bring children’s, teen, academic/study aids, reference books, or magazines. I cannot list every genre here, but you get the idea; please use your best judgement. ~Books must be in good condition. Books that have missing or teared, stained, molded, covers or pages and/or have obscured words will not be accepted. Denied books will be returned to you; we cannot dispose of or donate them for you. 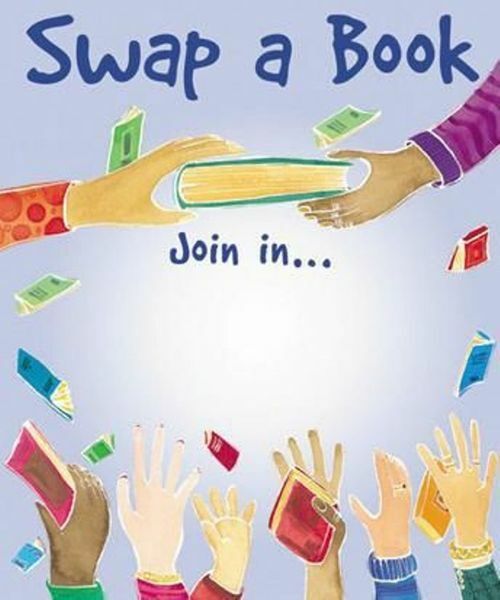 Bringing at least one book is required to participate in the swap. Wow that sounds great! Wish I could go, but New York is just too far away. Have a great time!